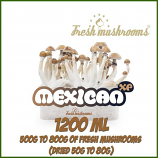 The P. Cubensis mushrooms that grow out of this Mexican Magic Mushroom Grow Kit are perhaps the most well know magic mushrooms. Mexican is often tried by people for the first time, though this is an all round mushroom. Mexicans have slim stems and large, often wavy caps with a light brown colour. This variety is very productive thanks to the fast, easy cultivation and visionary state of consciousness reached and is among the most popular in the world. Recommended for both experienced and inexperienced users. 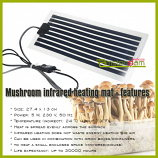 Due to the quality of the mushroom, the active substance content is considerably higher than that of the traditional grow kit.